Family has always been important to me, but this year, more than ever, I'm putting family first. My son, Matthew, is a senior in high school and you better believe, I want to treasure this time before he heads off to college. So instead of teaching most afternoons, I'm leaving time to cook yummy meals and try new recipes. Is it my shameless attempt to lure him home when he's off at school? Absolutely! But seriously, my real goal is to simply be...AVAILABLE. If he's free and wants to hang out with me (be still my heart!) I want to be available. The last thing I want is to look back with regret because I didn't cherish this time. Of course, all of this hinges on my ability to say NO and truthfully, that's not easy for me. I'm a "yes" girl at heart. I want everyone to be happy. But setting boundaries is important. I've written before about the necessity of learning to say NO and this "yes" girl is definitely getting better! Mostly because I'm getting a lot of practice! Yikes! Just looking at that list stresses me out! But you know what's crazy? Normally, I would have said "yes" to everything without even blinking. I would have reworked my schedule to make everyone happy and then I would have been completely overwhelmed. Not this year! My priorities are set. One of the best parts of this decision is that I feel a huge weight off my shoulders. Since I'm not overwhelmed with commitments this year, my focus will be better. And I'm excited about that! There will be time to prep for piano students. ​There will be TIME. Because I'm MAKING time - for the things that matter most. I'd love to hear how you're making time for the important stuff! I have a couple friends that I meet routinely for coffee. Well, they do coffee. I'm a tea girl. A couple weeks ago, we were scheduled to meet and I literally couldn't get myself out of bed. I was so tired, I kept resetting the clock for 15 more minutes. Then again - 15 more minutes. Finally I just texted them and said I couldn't make it. I was just too. tired. Fast forward to last week and something weird happened. I've never been one to bounce out of bed at 5am, but on Wednesday, I did. I woke up around 6:30 - without the alarm clock - and realized - I feel good. Really good. It was kind of.....weird. And it made me realize that hadn't felt "good" in quite a while. The combination of a busy season of life and the recent time change has been tough. I feel tired. And unmotivated. I don't feel like myself. I know exactly what the problem is - I need to rework my morning strategy. Because even though I don't always bounce out of bed, I do LOVE getting an early start to the day. It feels fabulous to check off some of my priorities before breakfast. We all go through different seasons of life. Routines need to adjust accordingly. My morning routine always includes quiet time (Bible reading and prayer) and I like to get in a short workout. This is where I've been struggling recently. At the end of the day, plans are great, but plans that include "fun" are much more successful! To "up the fun" in my quiet time plan, I'm adding in a good book - 40 Days to a Joy-Filled Life. And as far as the treadmill goes - It's probably going to be doing a walk/jog with a good Hallmark movie! I'm also going to come up with a reward system. Something like....workout 4 days this week and (insert reward here!) I'll have to spend some time thinking about that! Okay, so technically I've listed 2 things here: exercise and sleep. But they really do go together! When I get daily exercise, I sleep better. Period. As far as actual sleep, I've found that 7 hours seems to be perfect for me. That will be my focus for the next couple of weeks. Which means when the alarm goes off - I need to get UP! How can I prep for this? I'll put away the electronics early and curl up with a good book instead. Training my brain for sleep will pay off. 3. MAKING OVER MY MORNINGS - For the 3rd time! 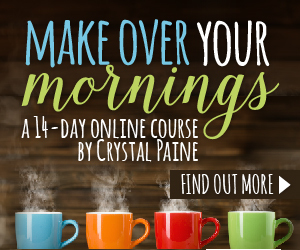 Starting Monday I'll be revamping my mornings with Crystal Paine's Make Over Your Morning program. This will be my THIRD time going through it and I'm SO excited! The first time, I did it with a good friend. Round #2 was with a few friends, and this time I'm teaming up with some Upbeats! ***If you decide to do this, please let me know! I've started a little FB group where we can encourage each other. We can cheer each other on!